Registration is now open for the 2019 NBA Summer Conference, July 7 – 10 in Bismarck, ND. Please register quickly and securely online here by June 22, 2019, or call the NBA at 303-292-2833 to register by phone. 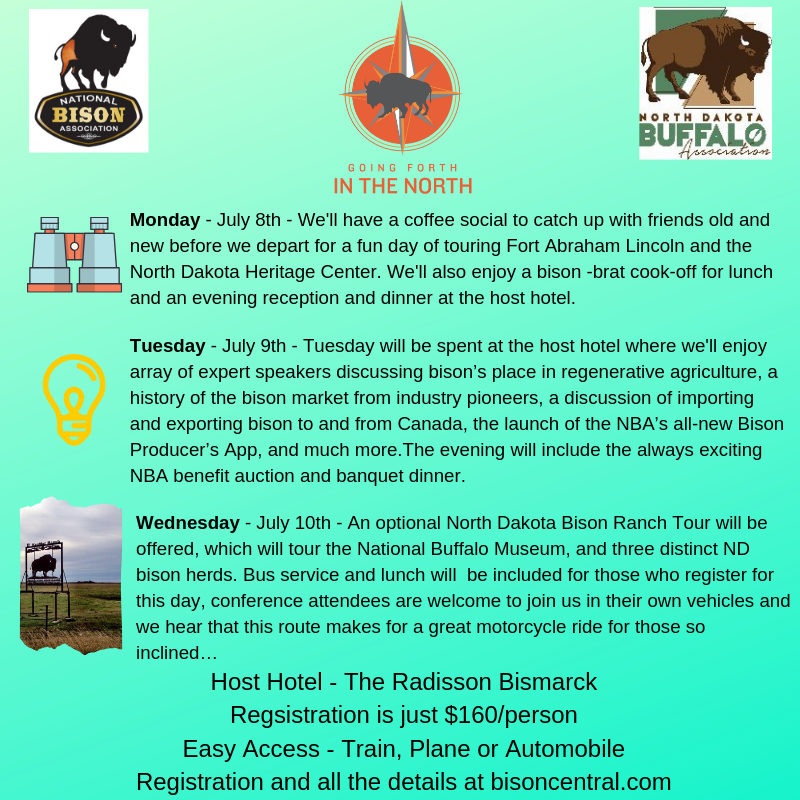 Going Forth in the North is the theme of the North Dakota Buffalo Association-hosted conference, and we hope NBA members head north, and south, to attend. We say head south, as we hope our friends to the North in Canada will join us! The agenda, which is currently being finalized, is action packed and includes something for every bison enthusiast to take home with them. The conference begins on Sunday, July 7th with a riverboat cruse on the Missouri River with hors d’ourves and a cash bar that is limited to 100 tickets. Monday will be spent at two local historical bison sites; Fort Abraham Lincoln in Mandan, and the North Dakota Heritage Center in Bismarck. Tuesday will be spent at the hotel conference center where we’ll hear from an array of expert speakers discussing the bison’s place in regenerative agriculture, a history of the bison market from industry pioneers, a discussion of importing and exporting bison to and from Canada, the launch of the NBA’s all-new Bison Producer’s App, and more. Wednesday will be treated as an optional Ranch Tour day that will include a tour of the National Buffalo Museum and three different North Dakota bison herds, including the 2020 Dakota Territory Young Gunz yearling bull futurity class at Heart Land Bison Ranch. While we’ll offer bus service to each location for an added fee, others are welcome to join us in their own vehicles and we hear that this route makes for a great motorcycle ride for those so inclined… And that’s not to mention all the fun that’s in store for this family-friendly conference. Please be sure to make your hotel reservation at the host hotel, the Radisson in downtown Bismarck. Reservations can be made by calling the hotel directly at 701-255-6000 and requesting rooms in the National Bison Association room block. If reserving online, please enter group code BISO19 to receive the group rate of $109/night at https://www.radisson.com/reservation/clearReservation.do. Please reserve your room by June 17, 2019. Please mark your calendars and stay tuned for more details!